Pasqua Rosée, a Greek servant of Daniel Edwards, merchant of the Levant Company, created the coffeehouse that began the European coffeehouse trend. Pasqua opened a coffee shack in St. Michael’s churchyard in 1652. Although the quality of the coffee was not exceptional many people enjoyed Pasqua’s shack. In no time Pasqua was selling over 600 coffees a day, which worried the owners of the surrounding taverns. Coffee was becoming an alternative to alcohol consumption. The early coffeehouses in London were only populated by men that met to discuss current events and share opinions on topics. The subjects of discussion included politics, gossip and debates about more profound topics such as philosophy and science. Coffeehouses charged an entrance fee of a penny, which usually limited the visitors to middle and upper class individuals. The charge of admission and the intellectual discourse that occurred at these locations inspired the nickname “Penny Universities”. Sharing ideas and opinions were encouraged while surrounded by the walls of the coffeehouse. 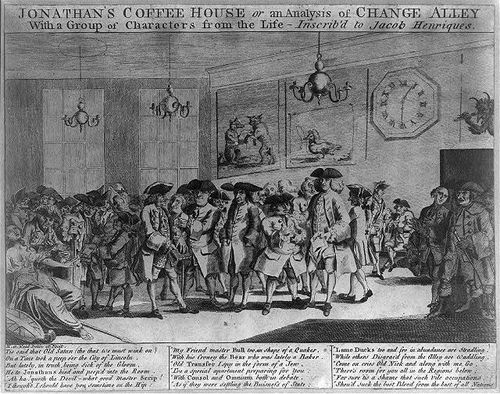 The exchange of different views between men gave birth to creations such as the London Stock Exchange as there was a designated table in the coffeehouse for such activities. Coffeehouses also had subscriptions to newspapers or articles for the enjoyment of the customers. The décor of each coffeehouse was as unique as the clientele that visited. A few of the most outrageous were those that offered hair cutting services and one that floated on the water. Regardless of the different characteristics, the primary purpose of the coffeehouses was an opportunity to socialize. It was easy for individuals to meet new people because of the communal seating arrangement. Long benches and tables made it near impossible for private conversations to take place. "London's Original and All-Inspiring Coffee House." Atlas Obscura. Accessed April 09, 2017. http://www.atlasobscura.com/places/londons-original-all-inspiring-coffee-house. Skinner, Chris M. "How The City Developed, Part Eight: the London Stock Exchange." Chris Skinner's blog. December 01, 2015. Accessed April 09, 2017. https://thefinanser.com/2011/12/how-the-city-developed-part-eight-the-london-stock-exchange.html/. "The Lost World of the London Coffeehouse." The Public Domain Review. Accessed April 09, 2017. http://publicdomainreview.org/2013/08/07/the-lost-world-of-the-london-coffeehouse/.